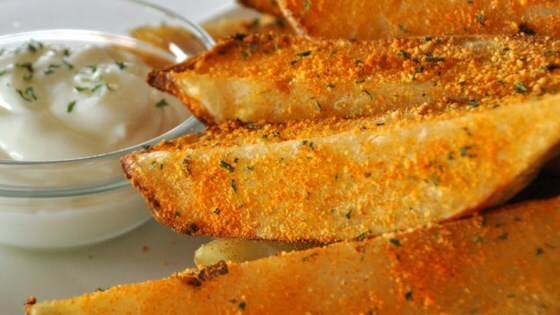 "These Tater Wedges are a great side dish when grilling. A great mixture of seasonings give them the pep they need to tickle your taste buds. Add more cayenne pepper if you really like it spicy." In a cup or small bowl, mix together the paprika, cayenne pepper, mustard powder, garlic, black pepper, celery salt, cumin and parsley. Set aside. When the potatoes are cooled, slice them lengthwise into wedges. Place them skin side down on a plate. Coat with cooking spray and sprinkle the seasoning evenly over them. Cover and let stand for 1 hour. We thought these were very good. I nuked mine,[I don't think that matters]because of the heat. I used oil with the spices and brushed these on the wedges, in my grill pan. Will make again.